You must write a valid program/function in one of the languages provided using only the characters in the toolbox. Your program/function should output the number of answers already present on this question. Once you have written and posted an answer the language and characters you have used will be removed from the toolbox and 1 new language and 12 new characters will be randomly added to be used as the toolbox for the next answer. The next toolbox will determined by this python program. 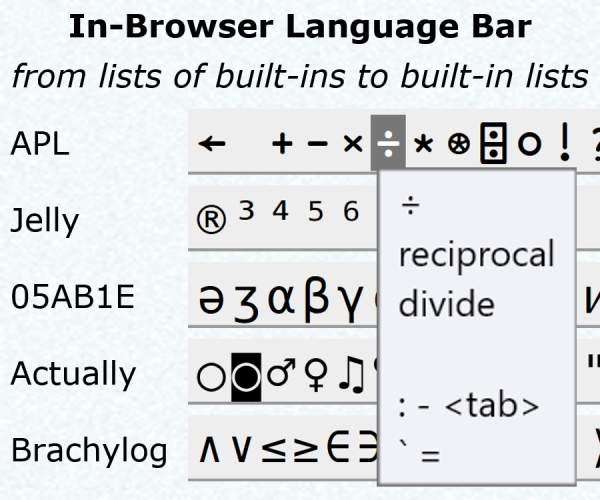 To generate the next toolbox put in the remaining languages and characters along with the post id of the last answer. The language list here is all the languages available on try it online at the time of this post. The characters have char codes 0-127. If a language uses a special encoding the characters should be interpreted as bytes (decoded from ASCII and padded with a zero). The starting toolbox will be randomized from this questions post id (126063), there will be 7 languages to start and I will add the characters echoprint0 and ascii 0-31 for free to get people started. Each person will have a score equal to the number valid answers they have provided. There will not necessarily be an end and I will not be accepting any answers. Intentionally using characters you don't need to stunt future answers. Attempting to game the post id system to make future tool boxes harder to use. Attempting to game the post id system to make future tool boxes easier to use. I can't prevent any one from doing these things, but I will be downvoting any answers I suspect are doing this. Coordinating with other users in chat. Try it online! This declares a function $ which takes any argument and returns 6, eg. by calling with $(). New toolbox. Powershell is the newly added language. Outputs is in cell -2. DStack is read in pairs and moves the cursor one char at a time, so the instructions become 22, 22, 22, and cK. I don't really know Assembly as, and information online seems hard to find ,so this is modified from the Hello World test on TIO. The main issue here is that we lack the 2 byte, (turns out we did, but hey looks like I saved a 2 for the next answer) this makes it relatively hard to print 26. We can't use raw ascii or even Hexadecimal (0x32) so I ended up using binary. Tells it to output the two bytes 2 and 6. 0000000: 7f 45 4c 46 01 00 00 00 00 00 00 00 00 90 43 0d  .ELF..........C.
I've done it! I have conquered the elusive ELF. ELF has been the first language in the list ever since the first toolbox. Now we can move on. I've never used or even heard of ELF before, so this one was an adventure to figure out. I eventually copied much of Dennis' 32 bit Hello, World! program (64 bit version here). I modified it to print 33 and was able to remove a line of bytes. I had no idea what powershell is, but it turns out that 7 outputs 7 in TIO. Miraculously all the characters needed were available. Next toolbox New language: pylons (Should be easy ;). You can see a Q here. TRANSCRIPT is designed to resemble interactive fiction scripts. So rather than using variables, objects and NPCs are used. Commands and dialog (essentially comments) are mixed together. This pushes 10 to the stack 28 times, then gets the length of the stack and prints it. We finally got an !! 9 is 57 in ASCII, which is 3 times 19. So in order to get 9 we add 19 3s and use ! to output. Prints ASCII values 49 and 56 (18). Try it online! Next toolbox. Arcyóu is the new language. Try it online! Declares a function f which takes any argument and returns 27. This can't be tested on TIO because MsgBox is a system window and that can't be seen online. The easiest way to test it is by pasting the code into a .vbs text file and running it on Windows. A .vbs file uses VBScript, a scripting version of VB that is very similar (MsgBox is the same between the two). It's fun to use MsgBox again as that was the very first thing I ever programmed. In fifth grade, I made a series of MsgBox scripts to mess with friends. --31 is the same thing as 31, then -1 subtracts 1, making it 30. Not the answer you're looking for? Browse other questions tagged restricted-source answer-chaining or ask your own question. Do you know that language? Does it Lead or Follow?